Vide etiam Matthaeus Calbraith Perry. 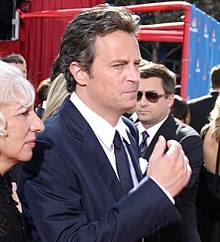 Matthaeus Perry sive vulgo Matthew Langford Perry (natus 19 Augusti 1969 in Williamstown, Massachusettae) est actor Americano-Canadensis, qui notus factus a serie televisuali comoedica Friends, ubi partes Chandler Bing egit. Novissima mutatio die 17 Maii 2015 hora 11:55 facta.